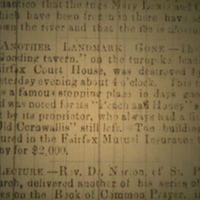 This is an article from The Alexandria Gazette stating that the Gooding Tavern burned down. It was a historic landmark. 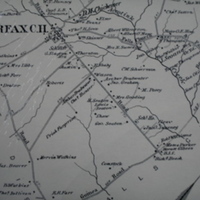 This map shows District 5 in Fairfax County in the year 1876. You can see the Gooding Farm. 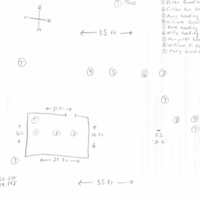 A hand drawing of the Gooding Family Cemetery. It marks all of the Gooding family, the trees, the GPS reading, and the compass reading. 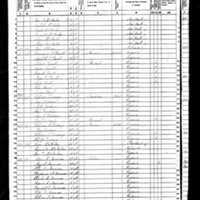 This is the 1850 Federal Census Record for William Gooding. It shows his age at 81 years. This article talks about the Gooding Family Cemetery. It also tells the story of Mosby's raid. In 1863, Col. John Mosby made a surprise raid on a force of about 63 Union cavalrymen. It took place at The Gooding Tavern. 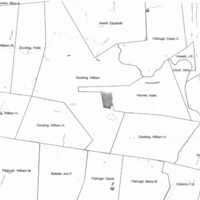 This map shows the properties of William Gooding, William H. Gooding, William M. Gooding, and Peter Gooding around the year 1840. 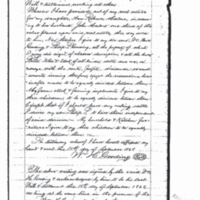 This is the Will of William H. Gooding. He is the son of William Gooding. It describes what he wants to give to his remaining living family members. This is the Will of William Gooding. This will was rewritten from the original making it much easier to read. This is the obituary of William Gooding. It talks about how the county lost one of its oldest members, and how much he was loved by the community. 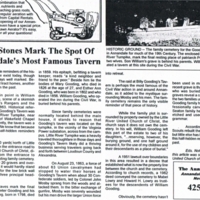 The article is from the Alexandria Gazette. 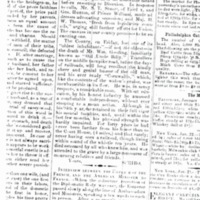 It was published on January 23rd, 1861.